There are a lot of real money casino games out there that are fun fuelled, adrenaline pumped roller coaster rides with more bells and whistles and excitement than a daredevil circus. The excitement and rush we get from playing them and earning our winnings is why games like blackjack, poker and roulette are so iconic. Then again, there are games that are nothing like these, so boring and and mind-numbing that you would literally prefer to watch paint dry or grass grow than play them. Sure you might win some money, maybe, but you will be bored out of your skull in doing so. So what are these incredibly dull casino games? What makes them so boring? We’re going to shine a light on some of these games so for future reference you can avoid them like the plague. Whether you play this game online or at the table of a bricks and mortar casino, this is one mind numbing game to suffer through. With most other casino games there is often some aspect of skill or tactic to be played: not with Casino War. Casino War is essentially a game of high card. The dealer will deal a single card to each player before revealing their own card. If your card is of a higher value than the dealer’s, then you win. If not, you lose. If that isn’t bad enough, if your card and the dealer’s is of the same value, you have the option to “Go to War” which is very similar to doubling down in Blackjack which requires you to match your initial bet to continue, much like doubling down. However, if you win the “war” then you are only paid on your initial bet, but if you lose, your initial bet AND your double is taken. So not only is Casino War a mind numbing, repetitive game which requires no skill, it is also a blatant rort! And because the game is so quick, because no action needs to be taken at all, you can lose a small fortune in five minutes flat. At first this might seem like a really exciting and suspenseful game, but don’t be fooled, it is a suckers game that could bore the beak off a platypus. This is another game that requires no skill or intelligence on the punters part, it comes down to dumb luck: you would have as much fun playing Russian Roulette. You place your chips on which symbol you think will spin up then wait while the wheel spins for what seems an eternity. It is often mind-boggling how long that wheel can spin before it even appears to be slowing down a little. Then when the wheel finally comes to a merciless stop, the dealer swipes your chips or pays with such shocking odds that you feel dirty, cheated and used. All casino workers in Australia dread working the Wheel of Fortune on a Friday or Saturday night, because they know they are going to be surrounded by drunk Aussies hurling abuse at the wheel for stopping just short of the top prize. Because of its simplicity and slow nature, the Wheel of Fortune is the perfect game for drunks. This is another game that can get very tedious and boring very quickly. Sic Bo, like Casino War and the Wheel of Fortune, requires no skill or tactics from the punter whatsoever. It is this auto-pilot style of play that leads to boredom very quickly. Sure, Sic Bo seems as though it has all the action in the world going for it with massive odds, flashing lights and three dice. But the novelty wears off very quickly once you come to realise that there is no real gameplay or interaction. 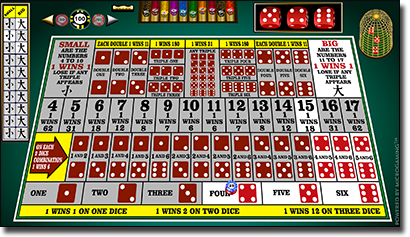 The dealer just pops the dice and the board lights up with the winning dice combinations. Not exactly the sort of game you can sink hours into or really challenge yourself playing. This is more like a kids game that you can bet on. This is a funny game. You get roped into Caribbean Stud by the flashing lights and the allure of the jackpot’s connected to five different hands, but once you have sat down and begin to actually play the game itself, you begin to go soft in the head from boredom. To play Caribbean you need to place an ante and a $1 bonus bet, then the croupier will deal you five cards and then themselves five cards, revealing a single one for the table to see. From there if you are happy with your cards you can put forward a bet, which must be double the size of your ante. 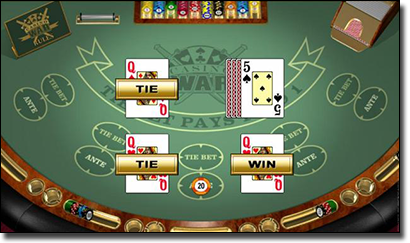 Different odds are paid on your bet for different hands, while the ante is always paid at even money if you win. The boredom comes from the fact that the dealer only qualifies with an Ace, King or higher. This fact alone really stifles the game because it is truly possible to go hand after hand without the dealer qualifying. Not only does it get boring when the dealer doesn’t qualify but it can get frustrating too. Say you had a three of a kind or even a straight, but the dealer doesn’t qualify, then only your ante is paid at the standard even money, while your bet is essentially a stand-off with you missing out on the odds associated with the hand you have.